NEW JERSEY (1914) The 36 foot wooden freight hauling gas schooner New Jersey disappeared with all hands between Sinuk and Point Hope in October 24, 1914. Five persons were lost in the disaster; captain John Chotok of Nome, O W Ranke of Nome, Joe Ezina, and two Eskimos; Oolock and Kopkonna. Four of the men were returning from the recently rescued Stefansson Expedition. 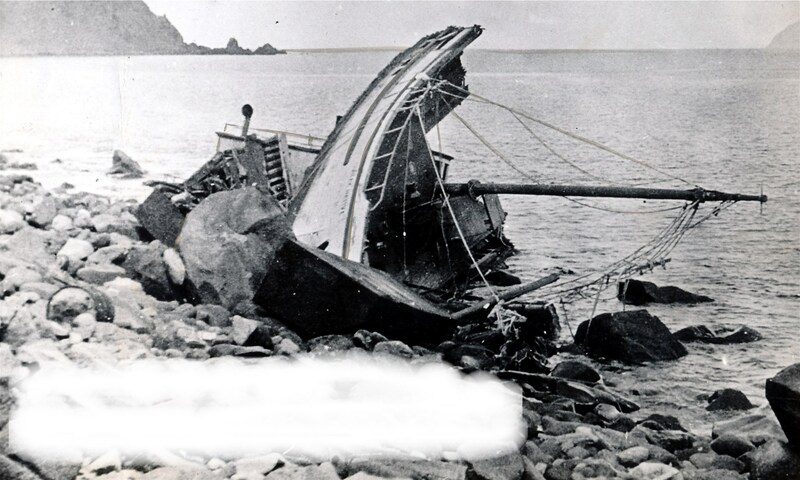 Wreckage from the schooner came ashore at Cape Thompson south of Point Hope. NOME (1900) The barge Nome was lost in the storm of October 31, 1900 on the beach at Nome along with a great many other vessels. NORA (1913) The undocumented gas screw Nora was lost while towing the 16 ton wooden schooner Princess October 12, 1913. Both vessels were found bottom up on the beach a few miles west of Nome. The Nora and Princess departed St Michael October 9, 1913 bound for the Kuskokwim River with three persons aboard the two vessels. It is assumed that the vessels were overcome by the southerly gale blowing at the time in Norton Sound. There were no survivors to give particulars. Lost were Martin Brimhall, Charles Green and an Eskimo Boy.